The 107,000-square-foot building, which houses academic programs in the College of Architecture and Environmental Design, features radiant flooring, high energy-efficiency LED lighting and a planted roof. Yale's Edward P. Evans Hall, housing the university's School of Management, features high-performance windows, interior and exterior solar shading, rooftop solar panels, a reflective white roof, additional insulation, LED and daylight-controlled lighting, carbon dioxide sensors that adjust circulation of fresh air as needed for the number of people in each space, and high-efficiency shower heads, urinals, and toilets. Potable water is not used for irrigation. 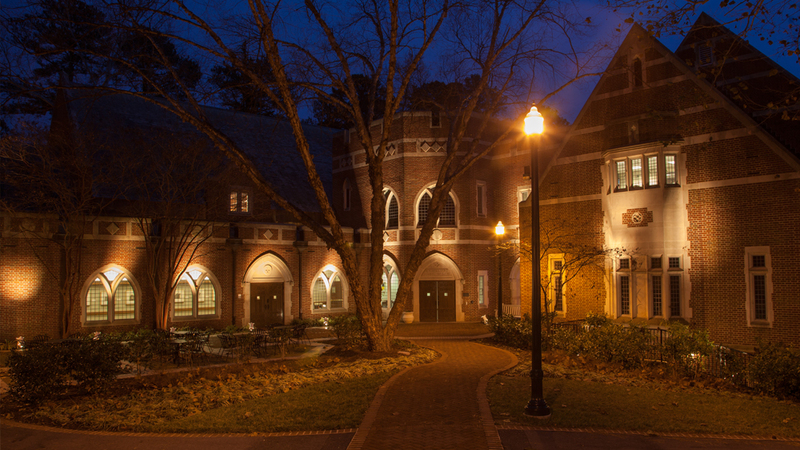 Evans Hall provides covered parking for 104 bicycles and seven electric vehicle charging stations. 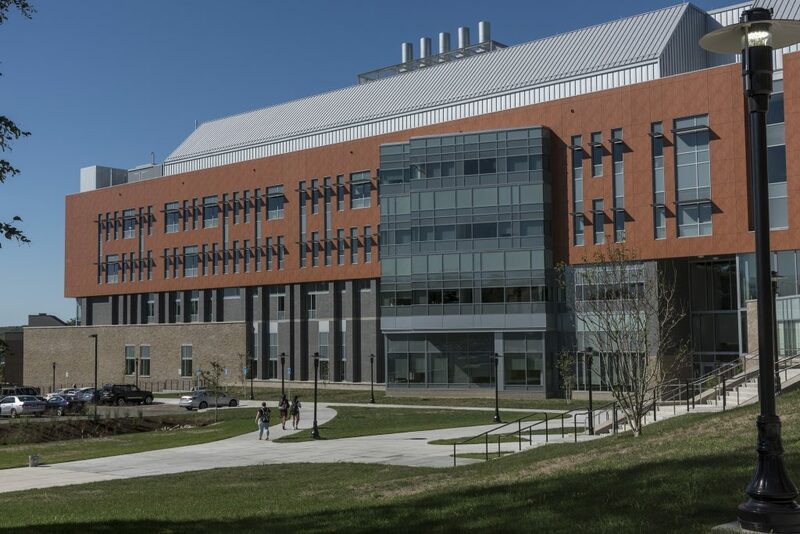 The building that houses the university's Department of Mechanical Engineering features a 34.2 kilowatt solar electric array, an energy-efficient air conditioning and heating system, energy-efficient elevators, and a new pedestrian walkway. 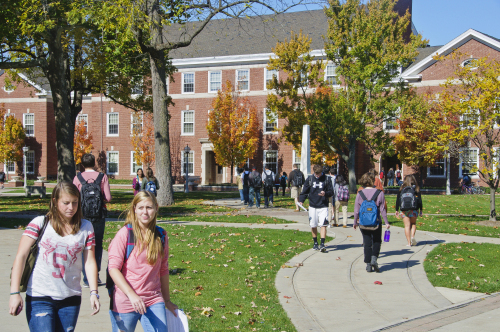 The university's Revolving Loan Fund helped to offset the cost of making these changes to the building. 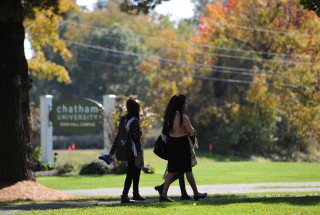 Chatham University's Eden Hall earned the award in the Higher Education Institution category from the Center for Green Schools at USGBC, in collaboration with the Green Schools National Network. The hall was cited for its self-sustaining aspects, which include protecting the watersheds, incorporating surrounding land and agricultural resources, and rehabilitating existing farmland. 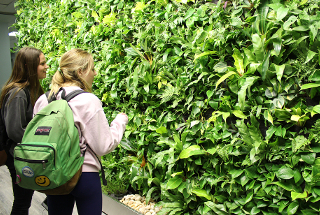 In an effort to inspire creativity and support well-being, living plants now cover the surface of an interior wall at the university's McKeldin Library as part of a series of renovations to the library’s busy first floor. 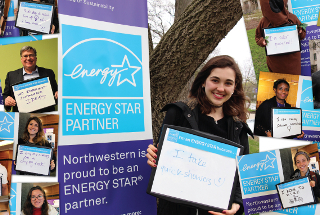 The bio-wall project was partially funded by students through the University Sustainability Fund. Undergraduate residences Flaherty Hall and Dunne Hall contain high-efficiency faucets, shower heads and toilets, and used regionally sourced building materials. During the construction of both residence halls, project managers eliminated and minimized waste as much as possible, and reused materials when feasible in the construction of the halls. More than 80 percent of the construction materials for the General Classroom Building were recycled on the job site and flooring, drywall and ceiling tiles in the building all include recycled content. 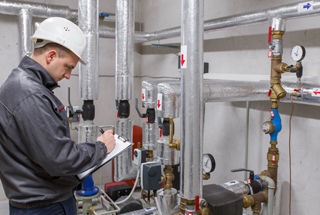 Water-saving plumbing fixtures were installed and indoor water use was reduced by 38 percent compared to a similar building designed to code. 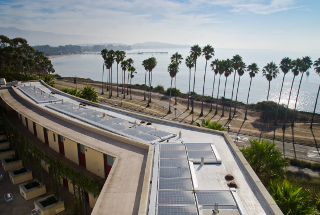 The existing campus solar array provides approximately 15 percent of the building’s electricity. 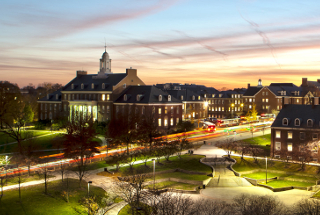 University Hall features LED light fixtures, water-efficient plumbing fixtures, better indoor air quality, and more natural light, reducing the building's energy footprint. 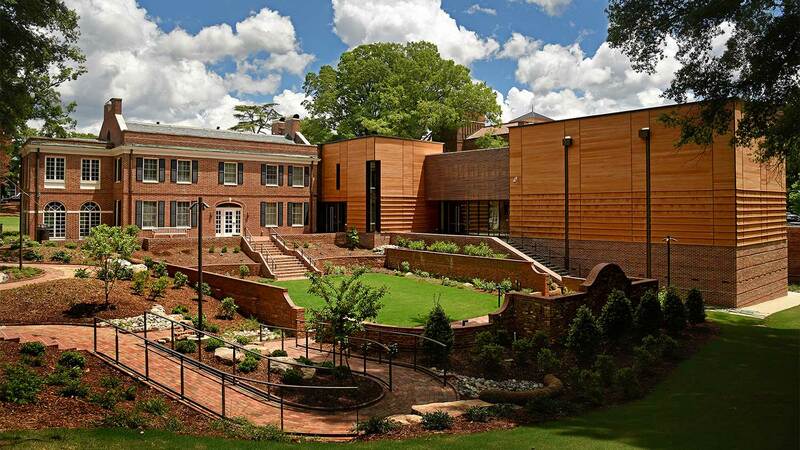 The university's Hoover Dining Hall is a 48,600 square-foot facility that seats more than 600 people in the main dining room with an array of smaller dining rooms that provide additional seating options. Food Services implements zero waste initiatives, such as reusable carry-out boxes, trayless dining, composting and using leftover fruit peels to make infused water. The university also donates leftover food to those in need and gives a portion of its scraps to local farmers for livestock feed. The building’s native and water efficient plants will reduce water use by 52 percent, a reflective roof will reduce heat absorption from the sun, and there are preferred parking spaces for low-emitting and fuel-efficient vehicles, as well as visitors who carpool or vanpool. 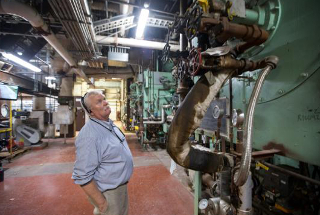 The renovation of 70-year-old Arthur H. Anderson Hall incorporated low-flow water fixtures, daylighting, new boilers, and low-VOC materials. 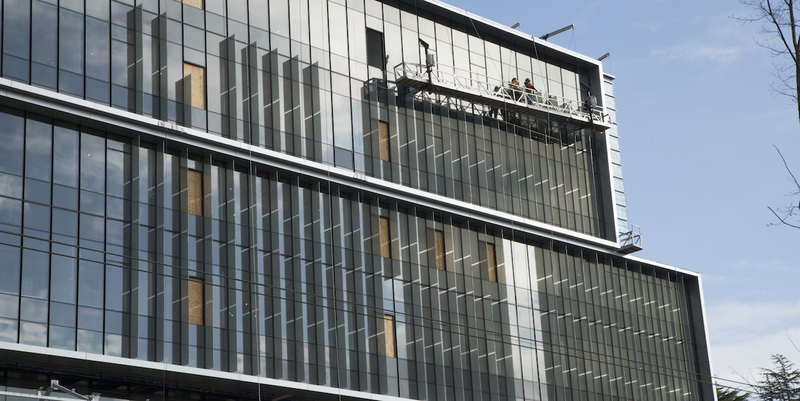 The building is expected to achieve energy cost savings of nearly 40 percent below baseline. 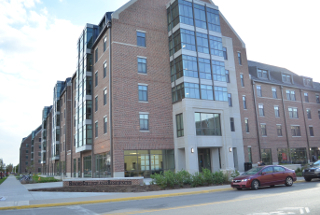 The three residence halls feature low-flow toilets, sinks and showers, and occupancy sensors that turn off LED lighting when rooms are unoccupied. Each of the renovations incorporates rapidly renewable materials such as bamboo flooring in lobbies and lounges. Schar Hall and Steers Pavilion were designed to provide green space and pedestrian walkways to encourage the use of outdoor space. All of the plumbing fixtures are low-flow, and landscaping around the buildings is designed to minimize the need for irrigation. 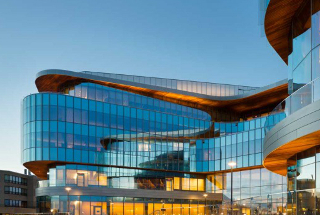 The buildings are about 32 percent more energy efficient than those that meet the standard building energy code, and the buildings’ water, natural gas and energy use can be observed through a real-time monitoring system. During construction, 95 percent of the waste was recycled or reused. Construction of a 164-bed residence hall is currently underway and will feature ground source heating and cooling and a photovoltaic array that will partially power the building. Faculty expertise in the university's Institutes of Energy and the Environment led the United Nations to ask the it to lead the Global Building Network, a global network to advance building science, construction processes and building management that advances energy efficiency and human performance. 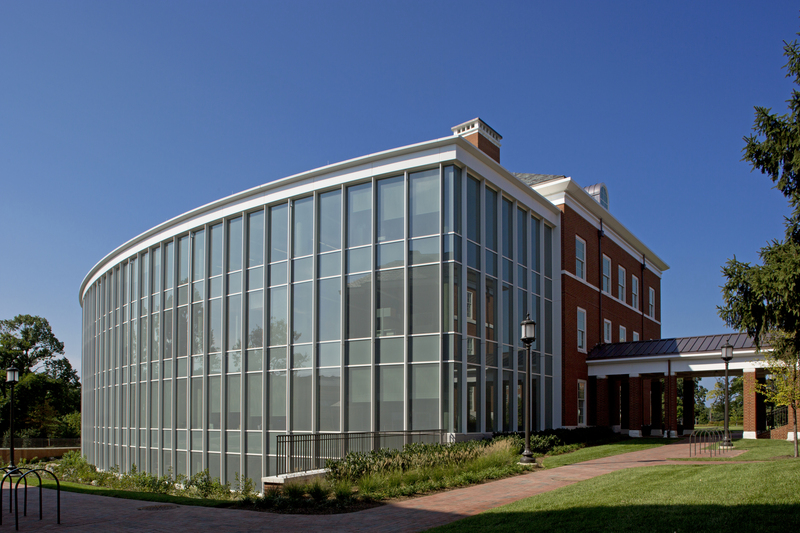 Bren Hall was first certified as LEED Platinum for new construction in 2002, and in 2009, received its second LEED Platinum certification for Existing Buildings: Operations and Maintenance (EB O+M). During the 2016-17 academic year, students from a LEED Living Lab class broke off into teams for each of the eight LEED categories, assumed responsibility for a credit within each category, and submitted a complete application in spring 2017. 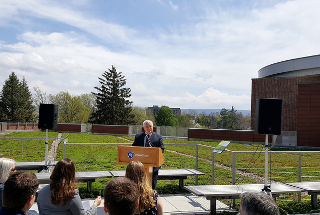 The building features a white roof, daylighting and energy-efficient fixtures, a 100 kilowatt photovoltaic system, and an energy-efficient lab exhaust system. The building's sustainable features include a series of green roofs, a rain water harvesting system, and white reflective membrane roofs that deflect sunlight and significantly reduce the energy load on the building. 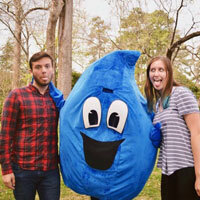 Under a new plan, W&M and the student group Take Back the Tap are working together to install water bottle filling stations in every high-traffic building on campus. New buildings and major renovations on campus now include a requirement for at least one bottle-filling station. 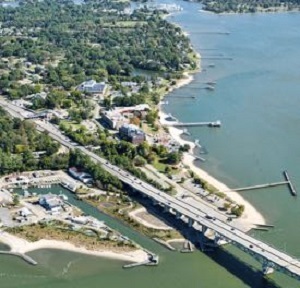 Currently there are 52 filling stations on the W&M campus and three at W&M’s Virginia Institute of Marine Science. The university’s newly certified Chemical and Forensic Sciences Center contains exhaust hoods and snorkels with sensors that activate them when teaching and learning laboratories are in use and power them down when they are idle, occupancy sensors for interior lighting, LED technology for exterior lights, and a rain garden. 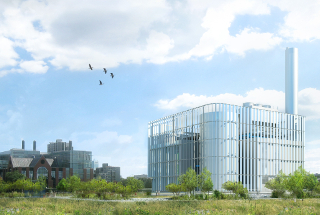 (China) The 200,000-square-foot building is connected to a RESET Certified air quality monitoring system, which uses a cloud-based tool to provide metrics regarding the performance of indoor air filtration. The system makes air quality data available to all building occupants. 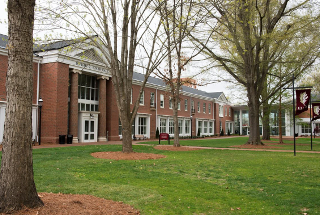 Improvements to the university's Steidle Building included installation of two new HVAC systems with heating and cooling based on occupancy, LED lighting with occupancy sensors and ability to self-adjust based on natural light, dual-pane windows with added insulation between interior and exterior walls, new roof and insulation, and low-flow energy-efficient fume hoods. Lobby furniture was made from recycled materials and materials were sourced from within 500 miles of campus. 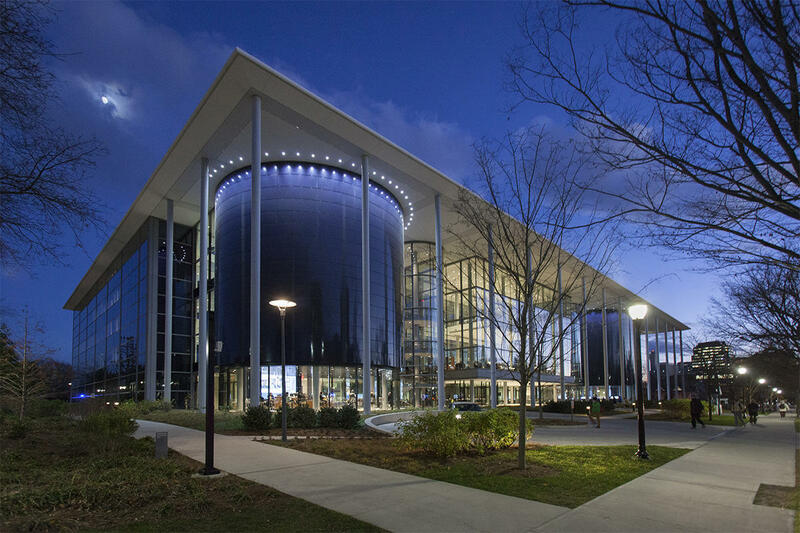 The university's new Kellogg School of Management building features a geothermal system, LED lighting throughout the facility and low-flow plumbing fixtures in restrooms and kitchens. Its landscaping is designed for efficient irrigation and contains plants that require minimal watering. 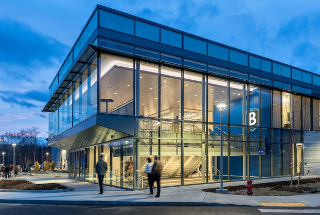 The building's location offers occupants various forms of public transportation, and cyclists have access to bike racks, showers and changing rooms. The 40,000 square-foot, two-story Fitness and Recreation Center is the fifth building on UT’s campus to achieve LEED certification. 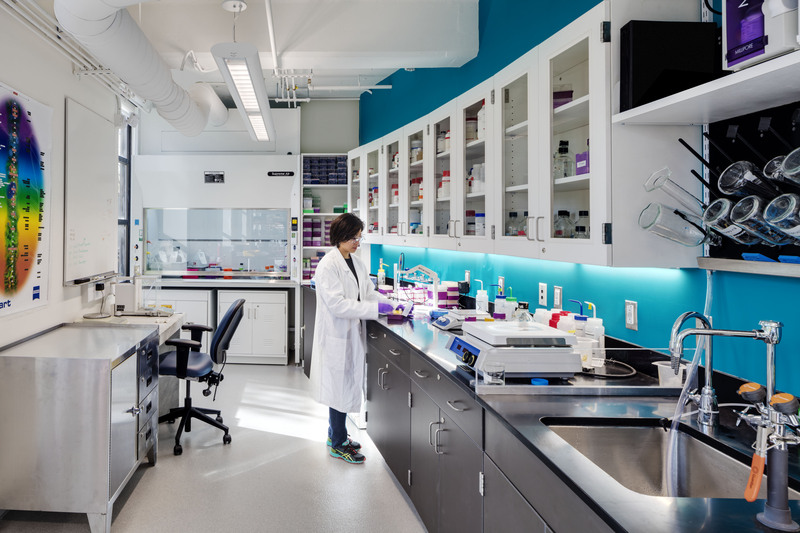 The Plant and Environmental Sciences Building, completed in 2001, comprises 140,394 square feet, about 80 percent of which is lab space. 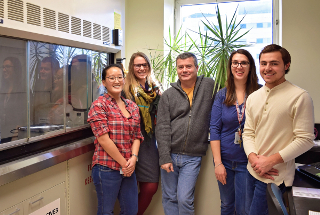 A lab retrofit project in 2014 resulted in 36 percent energy savings from temperature setbacks and reduced ventilation rates during occupied hours. Other green features include occupancy-based lighting and heating-ventilation-air conditioning control for spaces and fume hoods, low-flow fixtures and Energy Star-rated computers. The university is using the building as a test case for comparing the LEED and BREEAM rating systems. 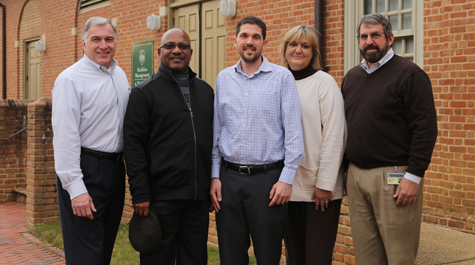 In late October, ISSA, a trade association for the cleaning industry, awarded William and Mary's Facilities Management the Cleaning Industry Management Standard (CIMS)-Green Building Certification, which means that Facilities Management administration and a staff of 165 custodians offer environmentally friendly cleaning across the campus' 170 buildings.